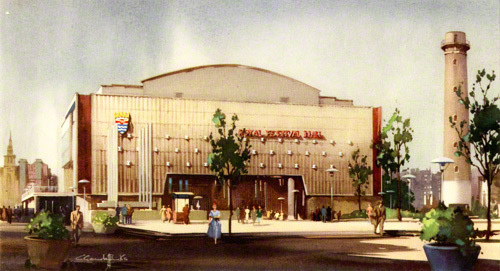 The view of the Royal Festival Hall from the south bank showing how it was originally designed and constructed with figures shown in the foreground and the view northwards away from Westminster Bridge. The Shot Tower is shown on the right of the picture. The painting by Claude Buckle is in water colour. This print of the original water colour may well have been done for the inaugural opening on 3rd May 1951. It is also possible that the painting was done before the building was constructed. Created in 1948.